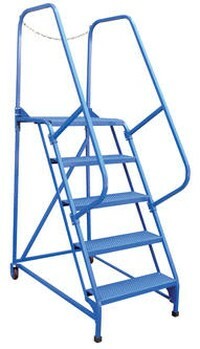 Portable ladders for use around warehouses, hardware stores or inventory rooms. Tilt the unit to allow for portability. Units roll on 4" poly-on-poly wheels. 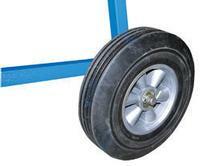 Constructed of square tubing framework which handles uniform capacity up to 350 lbs. 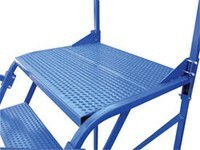 Features 30" high hand railing, access chain, 21" deep top platform, and an industrial blue powder coat finish. 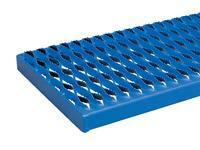 Each step measures 24" wide by 7" deep and is spaced 10" apart, Units are shipped crated, some assembly required. Complies with ANSI 14.7 and OSHA 1910.29 specifications.